Happy Easter to you! I want to share my most recent news, and also let you know about an Easter promotion we are running on “Not Without God.” The e-version of my book is practically FREE right now. There are only a few hours left! I would love for you to read it! Please take advantage of this special opportunity. Click on this link to read my update: http://eepurl.com/bi1CAL. May the joy, hope, and promise of Easter fill our hearts today and every day! Author Zina HermezPosted on April 5, 2015 Categories Writing, Speaking, and MediaTags Book signing, Easter, Not Without God: A Story of Survival, OhioLeave a comment on Happy Easter! The e-book version of Not Without God: A Story of Survival will be on sale for ONLY $0.99 from March 29 to April 5 on all platforms! It’s an Easter sale! So excited to give it away! It’s almost FREE. Please take advantage of this special opportunity! We want good things, and we become disappointed when life doesn’t go as planned. We can try to see our obstacles as experiences that bring us closer to our purpose, and that may relieve some of the pain. I think everything in my life is the way it supposed to be, but that doesn’t mean I like the way everything is. I complete the tasks set before me. I press on, in faith. From strength to strength, I am being shaped. When you’ve gone through something tragic, you can feel a deeper sense of appreciation for life. People tell me “you’re so strong” all the time. Perhaps I am; but for me to be here is a part of God’s plan. He controls everything. I think sometimes people have this misconception that they are rewarded because of their effort and everything they do. Good things happen to them, and they get surprised when bad things occur. We can’t get angry when things go wrong in our lives. God wants to bless us. He wants to be there for us and be our best friend. But we have to trust Him. In time, He makes all things right. All my life I’ve had to fight. I’ve been told I’m too independent, and too strong. I’ve heard, “don’t you need help?” And how can I live, “by myself.” What people don’t understand is you do your best to compensate when you’ve lost so much. Strength is my survival skill. I wouldn’t give it back for the world! I DON’T KNOW HOW TO GIVE UP. From a young age, I had to be tough. I had to make my own decisions. Our life experiences shape us into who we become. I can’t alter or change myself to appease others. We tend to shun what we don’t understand. I can’t feel guilty for being me. We’re all different. I march to the beat of my own drum. In a culture like this one, I am not the norm. Thanks for listening to my rant! I did not know for sure I would become a writer. Though I had a feeling I would write a book. Watching it come to fruition has been fabulous. There is so much more I want to write. Writing about yourself can be closely monitored. There’s something about telling your own story. It’s different from writing a fiction book where you can hide behind characters. The Little Things in Life Really ARE the Big Things! As my birthday approaches on Monday, I’m grateful for my life. In the back of my mind, I feared I would not make it past thirty when I was younger. I thought that way because of my accident. Here I am, it’s been twenty years since that fateful day. I’m still here. I had a strong feeling I would influence others through all that happened. I wanted to help the sick, the hurting, and those who are helpless. 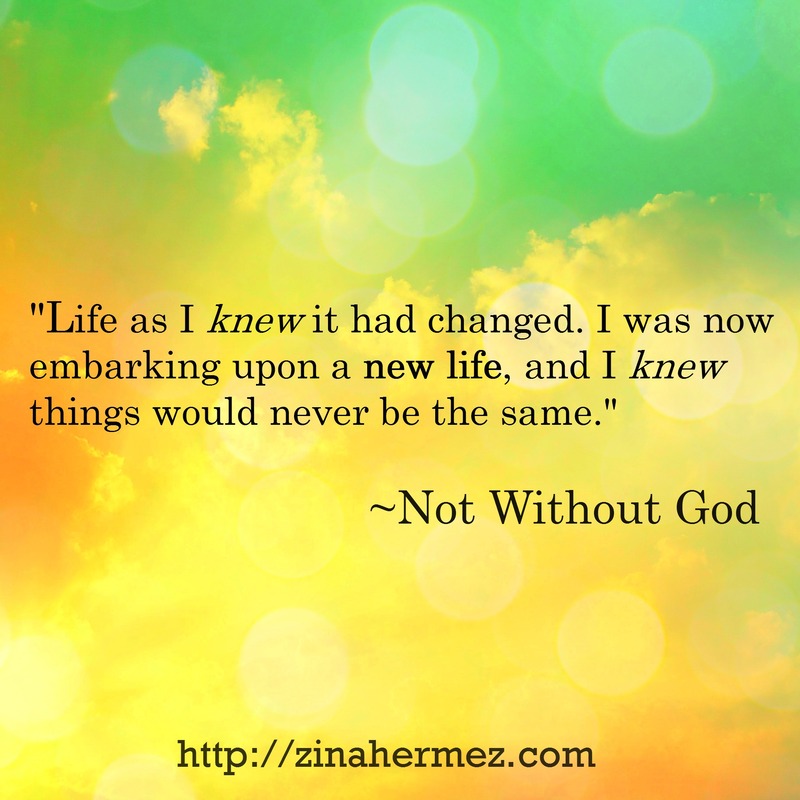 My book, Not Without God is only the beginning. I’ve been blogging to reach out to others with or without spinal-cord-injury for two and a half years. But there is more I want to accomplish. I try to offer hope in as many ways as I can in my book and on my blog. I have been there so I can relate. I understand what a lot of people are experiencing. In some aspects, I had to grow up fast. When I’m asked how I walked again when I’m out in public, or how I survived my accident—I talk freely of my faith and of how God saved me! I’ve been doing that for years. I want to give hope. I want to tell about Christ. It must be my energy, but strangers are often not shy to ask me questions. Very early while still in the hospital at Mott Children’s, I felt I would help others in some way. It’s no wonder I wrote a book about my life. It’s surreal, and exciting! I would not have made it this far without the love and support of many. One of my dreams was to finish college, and have a career despite all my injuries. I graduated high-school on time, and walked on a walker to receive my diploma. I fulfilled the promise I made to myself—to walk on graduation day. I worked so hard through college. I put a wheelchair in and out of the car several times a day. I began working in the classroom when an instructor asked me if I would like to be a tutor in Composition classes at twenty-two years of age. When others see me and sometimes express that they feel sorry I need to walk with assistance. I explain that each crutch weighs less than two pounds. They are much lighter than a wheelchair, and much easier to put in and out of a car! Some people don’t realize how good they have it until something bad happens, or until they meet someone like me and then their faith is challenged. Unless you’ve gone from paralyzed to walking, you really can’t understand how freeing walking can be! It’s one of the reasons I’m thankful for every day, and it’s why I appreciate EVERYTHING! My life is a miracle, and so is the ability to walk. Author Zina HermezPosted on January 25, 2015 Categories InspirationTags Birthday, Christ, life, Not Without God: A Story of Survival, walkingLeave a comment on The Little Things in Life Really ARE the Big Things! I had an incredible time last night! I really appreciated everyone coming out on a very cold day. Being an author is so enjoyable! It’s amazing that God keeps opening doors. I feel blessed, and grateful for this purpose. To be able to reach others through my writing is a gift. I signed and personalized books. I gave a short talk called A Few Ways to Overcome Adversity. It’s a spin-off from a podcast I am going to post. I got positive feedback from the guests. It was a great night! As you can see in the photo, my sister-in-law created this wonderful cake! It was perfect. Not Without God: A Story of Survival books were sold as well as Not Without God: A Story of Survival bracelets. Copies of my book and bracelets are both available online. Visit my website: http://zinahermez.com. I gave a free copy of Not Without God to our book raffle winner, Jeff! It was a night filled with laughter, love, friendship, and fun! 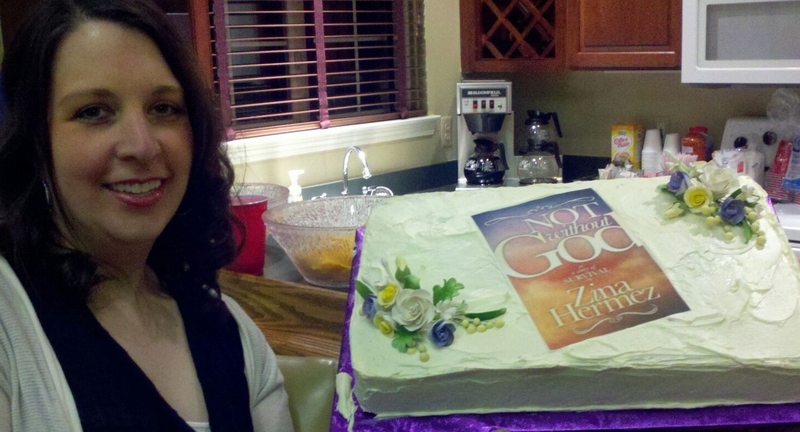 Author Zina HermezPosted on November 22, 2014 Categories Writing, Speaking, and MediaTags Book event, Not Without God: A Story of SurvivalLeave a comment on Book-signing party! Today I’d like to share a passage from my book Not Without God: A Story of Survival. As you may already know my life is a miracle, and so is the ability to walk after an accident that left me paralyzed as a teen. In the hospital I kept a journal, and each night at midnight—under my covers, with my flashlight in one hand and a pencil and pad in the other, with 10,000 Maniacs playing “These Are The Days” and “Garden of Eden” in the background—I would write. Here is a journal entry I wrote. I would ask God to make me a better person. I was confused. I knew there was a God and that He was mighty, but I couldn’t grasp everything. I believed my prayers were answered through my tragedy. I was thankful, and I felt lucky that God saved me from the accident. The outpouring of love and support made me feel even more fortunate. Every time I feel upset or down I try to revisit this place. A place where I was simply thankful (for breath and life). It makes all the other stuff seem not so important. I return to thankfulness and gratitude. This was a turning point, and it is from Chapter 2 of my book.